With the big day just 2 weeks away, I thought I would round up the most awesome St. Patrick's Day gear that I could find. 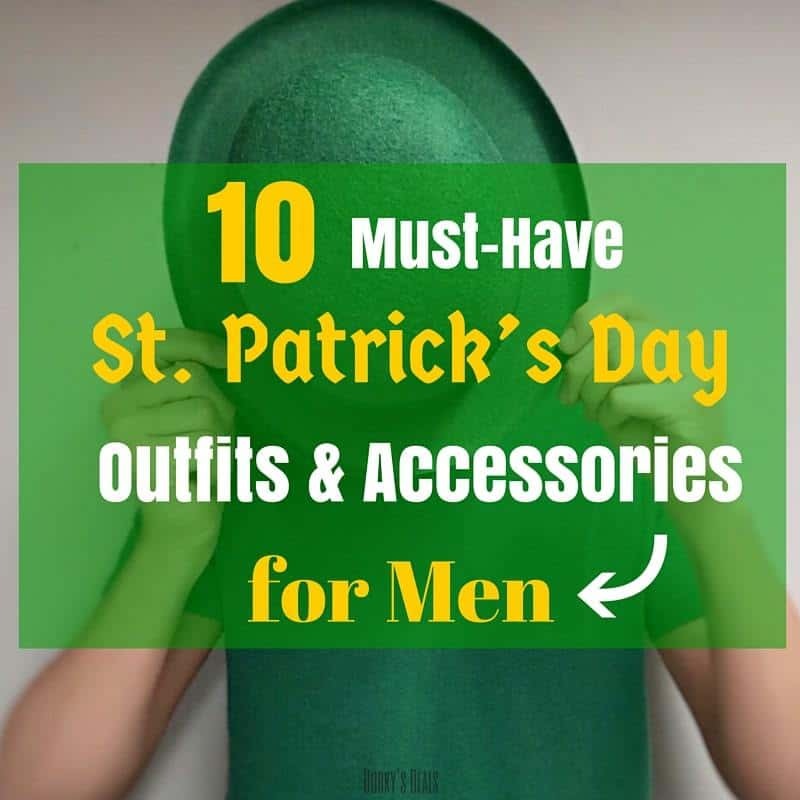 Below you will find 10 items that are perfect for giving you a festive St. Patrick's Day outfit for the big day!
. 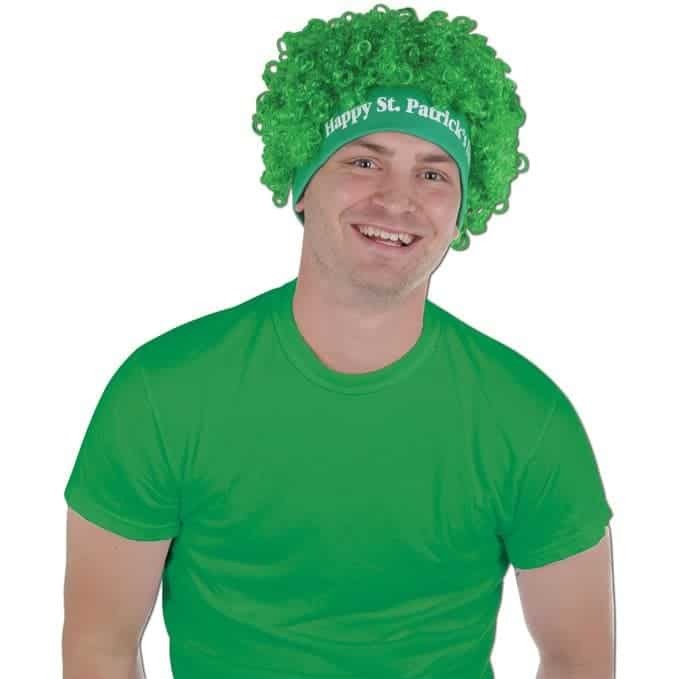 Not only does it give you a head full of green curls, but it also comes with a built-in “Happy St. Patrick's Day” sweatband. Can't beat that, double the festiveness! If you aren't into sporting a green wig on the 17th, I have just the thing for you – a stylish green fedora! This St. Patrick's Day Irish Kelly Green Fedora is perfect for hitting the pub's on the big day. 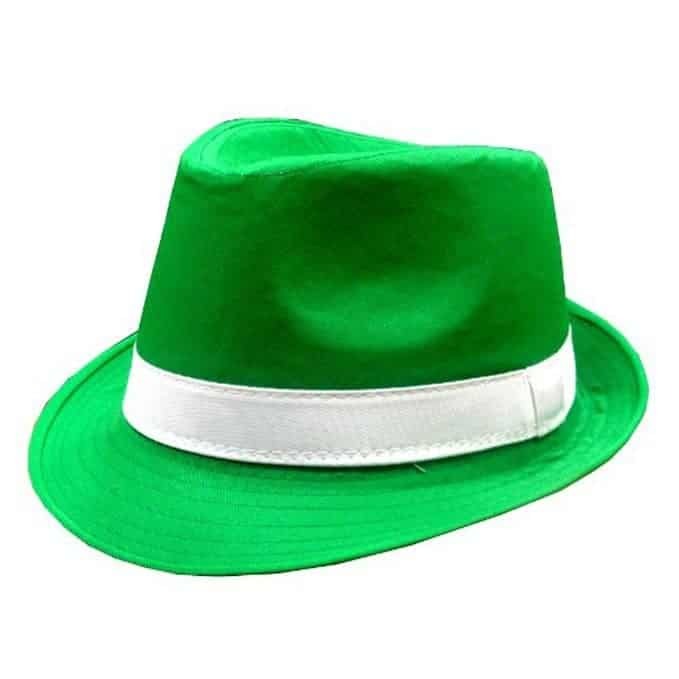 The Kelly green hat features a white accent strap around it and is made of 100% cotton, not that thin plastic material so many St. Patrick's Day hats are made out of. These unisex, one size fits all, Beer Knee High Tube Socks feature the the word “BEER” down the calf in large white letters. The top of the sock has two white stripes, giving them that retro look. 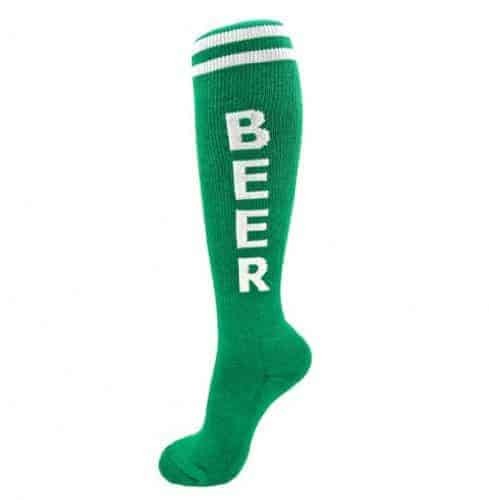 This pair of tall socks comes up to about the knee, and are the perfect socks to complete your St. Patrick's Day outfit and show your Irish pride and love of beer! 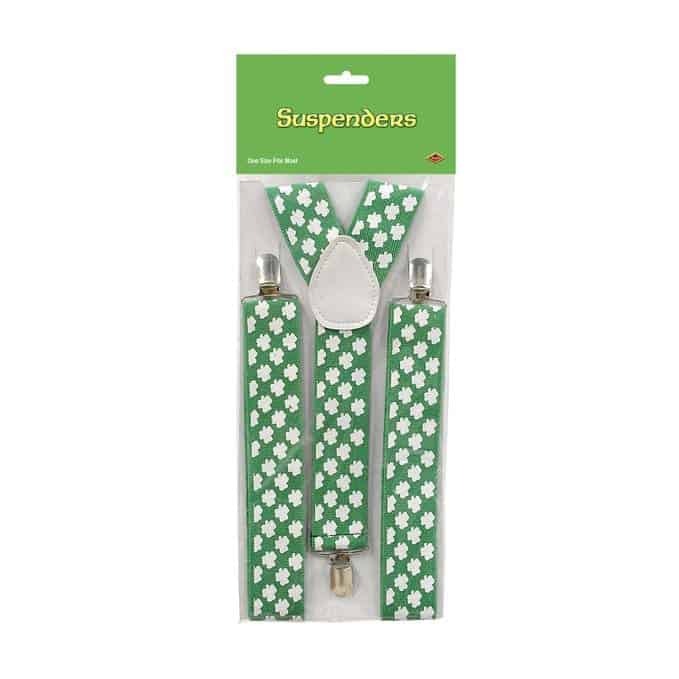 What better way to accessorize your St. Patrick's Day outfit than with a pair of St. Patrick's Day Shamrock Suspenders?! These elastic suspenders are one-size fits most and will look great clipped onto your pants on the big day, cuz nothing says festive and ready to party than a sweet pair of suspenders! Don't even think about showing up for your St. Patrick's Day party without a festive green mustache . Ladies love green ‘staches, let me tell you… so very handsome. 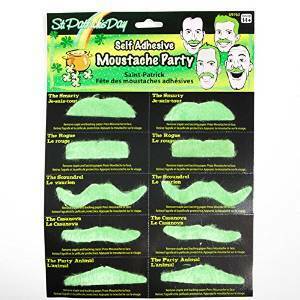 This set of St. Patrick's Day Green Self-Adhesive Mustaches comes with 10 – yes ten – bight green mustaches . The set features 5 different styles of mustaches: “the smarty,” “the rouge,” “the scoundrel,” “the Casanova,” and “the party animal.” With 10 St. Patrick's Day Mustaches there are enough to share with your friends for a group photo or to re-purpose as funky green eyebrows! 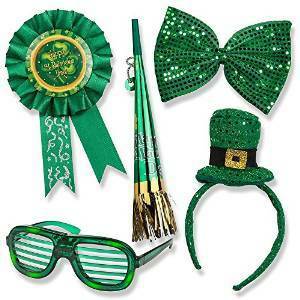 If you are one of those guys who prefers quick shopping, let me recommend this 5 piece St. Partick's Day Accessory Set. It comes complete with 5 fun and festive accessories which will have your ready to celebrate the holiday in no time. The set comes with a St. Patrick's Day Award Ribbon, St. Patrick Light up Glasses, St. Patrick's Mini Hat Headband, St Patrick's Day Giant Sequin Bow Tie, and a St. Patrick's Day Fringed Horn on a Chain. Bing, bang, boom, an instantly festive St. Patrick's Day outfit! St. Patrick's Day Tuxedos are expensive. Trust me, I checked. If you don't want to spend $100+ on a green tux, this St. Patrick's Day Long Sleeve Tuxedo T-Shirt really is the next best thing. It comes in at only a fraction of the price and it is much more casual and comfy. Just don't have one too many green beers and try to slip your hands in the pockets. The t-shirt comes in sizes small – 2XL so you will be sure to find one in your size. When enjoying a nice cold green beer on St. Patrick's Day be sure to keep your hands warm and festive with this pair of St. Patrick's Day Fingerless Shamrock Gloves. 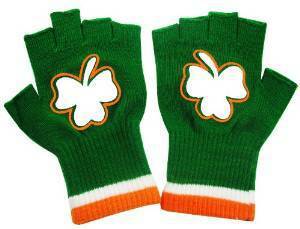 The gloves feature white and orange stripes around the wrists and large white shamrocks on the back. They are one size fits all, and are stretchy enough to fit even the largest of man hands. Plus, with no fingers to get in the way you will still be able to open your beers like a pro and engage in finger wrestling tournaments. You will be “seeing green” in these St. Patrick's Day Green Wayfarer Shamrock Sunglasses. The frames are kelly green and feature shamrocks on the lenses. Not gunna' lie, these bad boys may look sharp, but they are not so easy to see out of. While they may be great for photo opps and throwing down some green beers at the pub, don't try and drive in them! If you are serious about getting all decked out this year, this St. Patrick's Day Green Plaid Kilt is perfect for you. Now this is not a genuine Irish kilt, it is more of a novelty costume kilt, inexpensive and perfect for your St. Patrick's Day outfit. It is one size fits most so check out the size chart before ordering to ensure it will fit.